This fictional picture book, inspired by the tragic death of three-year-old Alan Kurdi's tragic death on a Turkish beach, follows young Marwan, whose father is telling him what Syria was like before their family was forced to flee. From the bucolic joy of an uncle's farm in the country to the happy bustle of the market place in Homs, the father expresses his love of his country and all of the good things in it. However, all Marwan knows is the political trouble, fighting, bombing, and eventual flight from the troubled country. 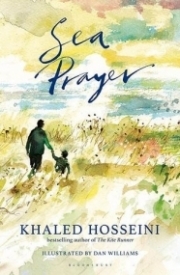 Now that the family is waiting on the shore to be transported by unsafe boats to another country where they will not be welcomed, the father prays that they will all be safe, and that they will eventually be able to find safety from the problems of their country and create a new life. This timely story is beautifully illustrated in an almost impressionistic, 1960s style. The pictures are at first full of yellow-- light and hopeful. As the story progresses, the palette changes to the cool colors of a dark and angry sea, although the very last picture has some touches of yellow to indicate a feeling of hope. Even the youngest readers will soon start seeing a number of refugees in their communities, and it's hard to help children understand the difficulties their peers may face. This book is a great resource for introducing the topic to older readers, and for helping them make more sense of what they might hear in the news. Nye's Turtle of Oman is similar in that it lovingly describes a country that is loved but which is being left, although under circumstances that are not quite so dire, and Senzai's Escape from Aleppo offers more details of the process of fleeing a country for older readers. Colfer's Illegal also covers the topic of refugees, but again for an older audience. I'm sure we will continue to see more books on this topic, and they will help greatly in helping readers understand and be empathetic to people whose lives are vastly different from their own.